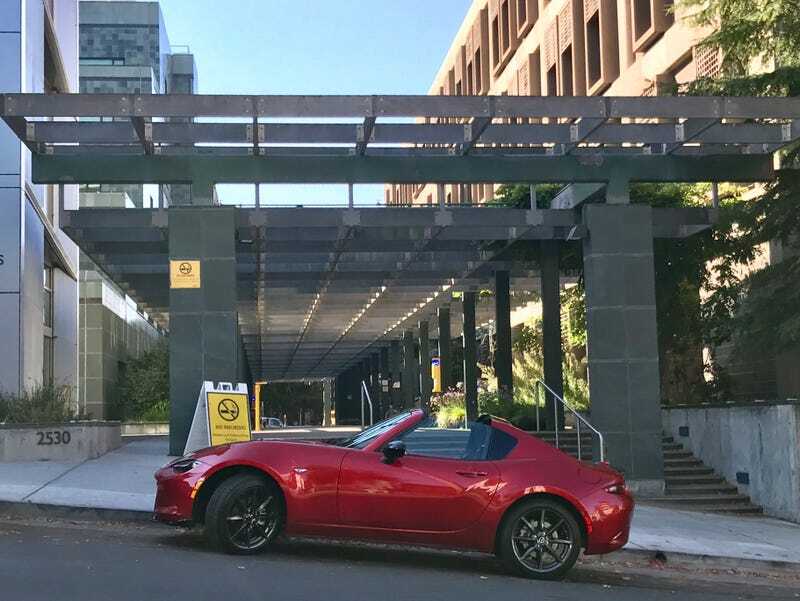 The Mazda Miata ND platform launched in fall of 2015 as the fourth generation flagship roadster and benefited from serious visual, interior and weight reduction efforts. In an effort to spare the casual reader, you can find all the specification details and journalist driving impressions wherever you digest automotive news. My wife, being the flavor of the week gadget person she is, immediately found herself in the drivers seat at our local dealership. Tight, nimble, fun! she proclaimed, but the soft-top convertible had her worried - won’t they slice the soft top and steal my stuff just like s2000s? That worry kept us from signing on the dotted line, and to our luck (and my wallet’s demise) the Miata ND RF arrived in the fall of 2016. Bringing classic targa looks and a slick 911-esque roof mechanism we were sold. A Soul Red Miata RF replaced our enthusiast spec BMW 228i in April as the proverbial quarter life crisis car. It is well known around these parts that a used, new or modified Mazda Miata is the answer to any and all automotive questions short of “how can I tow my Miata racecar?”. Frankly though, neither my wife nor I had ANY interest in owning a Miata until the ND generation came around. Mazda continues to rank well in the sporty, under $30K segment and any budding enthusiast shopping new or used would do well to experience a Miata. 8000 miles later and the Miata RF has been used for soul-crushing commute (SF-92 looking at you), city parking, airport shuttling, canyon drives, road trips and a track outing. It rarely sees a night in the garage and constantly reminds our neighbors of our mixed priorities. It is no surprise that compact and agile package makes the Miata RF a riot to drive in all situations from <70 mph public road speeds to no limit HPDE days. Yes, the Miata RF reinforces the slow car fast methodology but it also feels fast scooting around town and bombing down your favorite exit ramp. We put 53,000 miles on my Scion FR-S and it failed to deliver consistent thrills of the same magnitude. Top down driving has a large part to do with this, putting you out in the elements and drowning out all distraction. However, the peppy 1.5 L SkyActiv-G seems to pack a tad more low-end grunt than its FR-S/BRZ/GT86 counterpart and a spry <2500 lbs curb weight. The gearbox in the Miata ND is one of the best in the business; its crisp throws and precise movement are only outclassed by the likes of Lotus and Honda in my opinion. The light clutch makes rev-match downshifts a breeze and entices even the most novice drivers to try heel-toe shifts. Short throws and more heft to the gearbox would be nice but why mess with a great formula. Utility. Yes, utility. This little car routinely returns >30 mpg which is a necessity on an 11 gallon tank. The bluetooth and technology features are simple to use and often missing from similarly priced European models. While small, the trunk can carry 3-4 grocery bags without issue, a carry-on size rolling suitcase and I even squeezed my hockey gear into the passenger seat (sorry!). Simply stated, this car forces you to make far less sacrifices that the non-enthusiast population would have you believe. A car built for fun is guaranteed to have plenty of downsides and I will address them in order of most profoundly annoying to nit picking. The interior is a cramped pocket of space as-is, however the passenger footwell is reduced by nearly 30% due to a large bulge protecting the catalytic converter. When my wife bludgeons me with large purse to hold there is effectively zero footwell space. It’s buzzy, forget drone and think sheer road noise from a lack of real sound deadening. At speeds >60 mph (so, everywhere in CA) we definitely need to shout at one another to have a continued conversation, but the radio does a perfect job drowning out all thoughts. The seats feature limited adjustment and the bolstering could be improved, looking at those euro spec Recaro Miata seats :drool:. Now let’s get into those items that just eat away at you slowly from an ownership perspective. The stick on ipad looking infotainment screen trend needs to end. It looks bad, it feels fragile and in this instance it is easily washed out by sunshine or top-down driving. Moreover the controls are “conveniently” located directly behind the shift where my forearm and elbow tend to mistakenly change the channel and volume all the time. Forget storage space, you have two small cubbies and only one roughly the size of a sunglass holder that is readily available. The other is directly behind your right shoulder and inaccessible with the cup holders installed. The rear mounted cup holders require a yoga technique or shoulder mobility I do not have. Luckily there is one extra mounting space if you wish to further reduce the passenger footwell area. If this car has done nothing else, it has overwhelmingly brought my wife into the enthusiast fold of canyon driving and track days - and you cannot put a price on that! Her first outing at Laguna Seca came with 4,000 miles on the car and she absolutely loved it. The handling and throttle response were predictable with solid feedback from the chassis, note electric not hydraulic steering. She was able to easily place the corners of the car to hit the apex and ride up on the track curbing. It’s brakes were confidence inspiring although there has been some fade. Body roll in turns is hard to miss, but it makes the driver feel a bit more on edge. We will be upgrading to a Kraftwerks front sway bar soon. Unfortunately the Miata RF hardtop does not add to the safety provisions of the car and most HPDE outfits require the car to remain in novice class or install an aftermarket roll bar. No such roll bar exists for the RF at this time which meant I could not experience the car on track. Corkscrew! Fully loading the stock ND suspension. For $30,000 and change there are endless used and new car possibilities, but you would be hard pressed to find a car so capable of putting a smile on your face day in and day out. The Miata sips gas, is incredibly reliable and has just enough practicality for those without kids. Barring unforeseen circumstances this is a car that will remain in our garage for a long, long time.